Every child we know loves playing with a tablet computer – and now connected toys take learning to a new level by combining hands-on play with digital animations to teach the basics of story-telling, maths, spelling, reading and physics. Tablet toys are definitely not just for kids! By combining apps and wooden toys, French company Marbotic uses Montessori principles to develop number sense and introduce digits up to 100 and addition and subtraction. 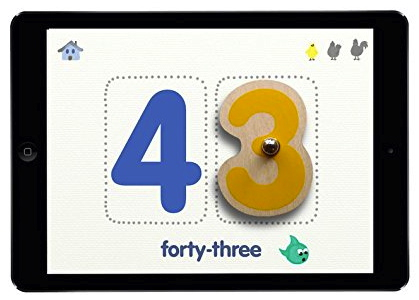 Children can also use their fingers to count "on" the tablet, or make up different values with the wooden numbers. The three associated apps (10 fingers, Up to 100, More or Less) are available in eight languages (so you can add some language learning into the maths!) and are perfect for Reception-age children who are just beginning to understand our number system and how to navigate it. 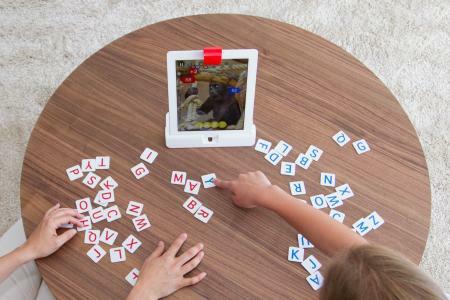 Turn your iPad into a teaching tool with an Osmo kit: letters, digits, dots and tangram pieces combine into a set that offers educational, hands-on play for pre-school to secondary school (and beyond). The simple set-up is a definite parent bonus: create an account for each child, so you (and they) can track their progress, then download the apps to play. Each activity uses your device and the Osmo stand and reflector "brain" to get your child to physically interact with what they see on the screen. Tangram offers over 500 puzzles to solve, using the wooden pieces and playing in front of your tablet. Words is a 21st-century letters and images vocabulary game (with a useful Junior setting for early readers), while Numbers encourages kids to problem-solve addition, subtraction and multiplication in lots of different ways (on their own or as a sibling-or-friends team). Newton is a real-world meets screen-world physics game which uses everyday objects as part of a virtual obstacle course. An original, beautifully-designed way to break down the wall between virtual and real-life learning. Hands-on learning is hugely important in early maths, which is why so many maths aids are utilised to great effect in the classroom. The Tiggly Maths system uses the same principles to get kids counting, adding, subtracting, working with number lines and solving basic mathematical puzzles with silicone counters. 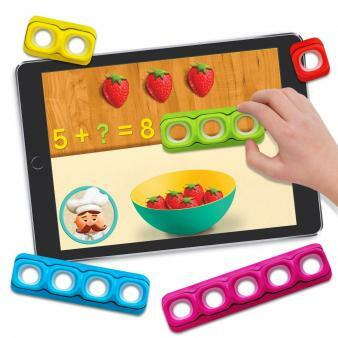 The counters (sized perfectly for small hands) interact with your tablet so your child can make numbers, complete number sentences and count with real objects, while following the silly antics and crazy illustrations of the apps' characters onscreen. Pebli Town is a connected preschool toy which uses play pieces and a play board that interact with a tablet (Apple and Android) through hotspot technology to bring the toy to life. There are four game modes: Story Teller (different narratives, presented through an app, where children can choose the path of a character), Game Player (problem-solving and comprehension games), Story Creator (children can "direct" their own story and add their voice and special effects, then watch their film in the Pebil Cinema) and Video Room (200 pre-approved educational videos featuring the Pebil characters). A great introduction to creative story-telling play, and we love the fact that up to four children (or children and adults!) can play together. The high-tech version of the "shows" and performances every child loves to put on! 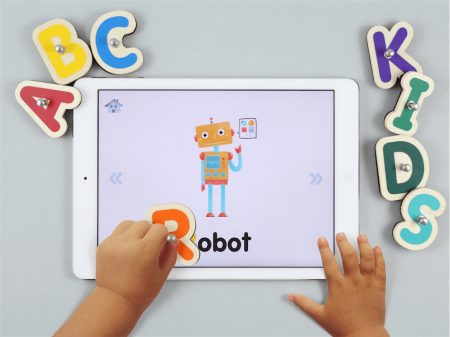 Our kids' generation's version of building blocks, Smart Letters work with apps and a tablet to bring words to life. The free apps are gorgeous to look at: Vocabubble animates pictures to reinforce early reading, while Alphamonster uses letter recognition and association games to help children with sounds. And there's always the old-school option of constructing words with the wooden letters on the kitchen table! Fantastic animations make words (literally) jump off the page with Tiggly Words: using the silicone vowels with your tablet, make Cookie Monster eat your words (and build early spelling skills) in Sesame Street Alphabet Kitchen, create stories in Tiggle Story Maker, explore the depths of language in Tiggly Submarine and learn about verbs, synonyms and other part of speech in Tiggly Doctor. Four free apps offer all the game play, with options suitable for Reception and throughput KS1. 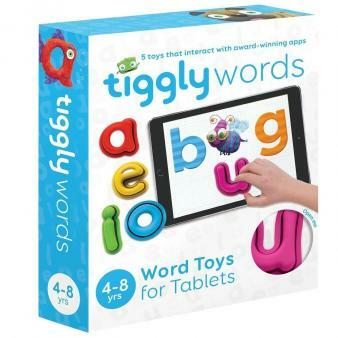 No batteries or wifi are needed and the chunky, tactile pieces are easy to keep track of, so Tiggly Toys are perfect for learning on the move.